This easy to follow Diamond Top Card Tutorial will add more even skills to your cardmaking repertoire, and have the recipients wondering how you did it. But don't be put off by thinking it is intricate because it is a lot easier than it looks and makes for a different look to "Wow" the recipients of your cards. 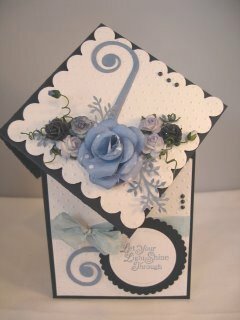 This short and easy to follow video tutorial will show you how to create another fantastic card. And I may be biased but I think it is a lovely card to give to someone you love... but it can be adapted for any occasion you wish. It is also suitable for your male cards too ... just leave off the flowers. These flowers are made following the video for Paper Roses and the result can be as special or as simple as you want. If your preferred method of learning is by reading then this is where you will find Written Instructions. 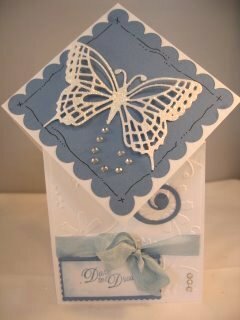 The butterfly on this card is from Marianne Creatables has been die cut and sparkled up with Glamour Dust. The ribbon is seam binding and you can colour it match your scheme by using this technique. And as predictable as I am ... I like to finish with some self adhesive pearls and these are from The Hobby House. Adding Gemstones is easy and as these are not self adhesive I have used a Bazzill basics template... but I can't remember where I got it from ... it's my age !! I hope this will be one of the cards that you will try and you will find lots of instructions both in video format and written for many different styles of card and many different ways that people like to learn..
Never be afraid to be adventurous and all these Tutorials will guide you gently through the steps to get perfect results for your self every time, and help you to build your confidence if you are a new cardmaker.